It's a platformer, with roguelike elements; the game is still trying to find its identity. 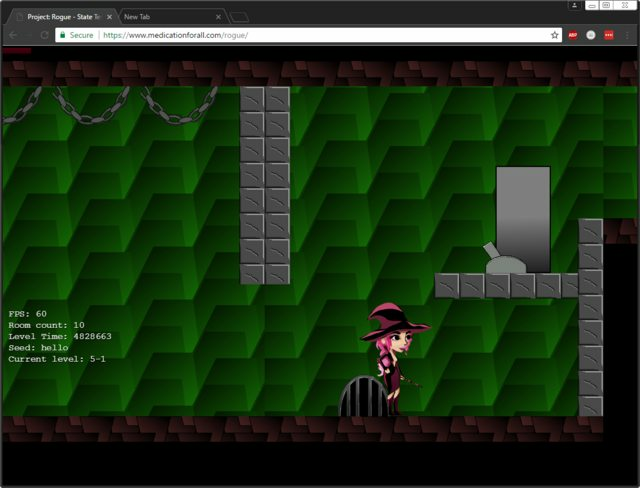 It is also my first attempt at making a game. As far as progress: really this week the big ticket item I worked on was getting the background sprites inserted. Which in retrospect seems benign, but it had been a nagging item on my todo list. Refactor how features are generated. Spikes colliding with enemy is killing the spikes. Walking sound can still play when jumping, because it's reliant on the player being still. Make inventory follow the same pattern as the merchant screen as far as passing inventory on open. Update Phaser to ce 2.8. Do not place pad statue combo in rooms with moving platform. Changed when crusher can be spawned. Decorations are rolled and placed into rooms.